This house is one of a pair of houses built by James Albert Hodges in 1905. The inscription on the builder’s stone in the front wall reads “J.A.H 1905” thus confirming the builder and the date. Number 1 is the house on the left in the above photo. John Hodges Williams – the 1910 Rate Book and the 1911 Census shows that John and his wife, Julia living there. In the census the house is referred to as ‘Clovelly’. They were still living there when the house was put up for sale in 1912 by James Albert Hodges. At the time of the sale, Number 1 was being let to John Hodges Williams at an annual rent of £30. We are not sure exactly what happened with the ownership of the house. It doesn’t appear to have been sold in 1912. The 1925 valuation list and 1926 Rating Book show that they were owned by the ‘Reps of the late George Hodges’. However we know from the minutes of the Congregational Church in Thornbury in July 1927 that a Mrs Skinner sold the house at 1 Pullins Green to the Church for £750. The Church had been renting the house for use as a Manse since 1918 and had offered £725 for the property, but Mrs Skinner insisted on getting the full £750. We discovered that ‘Mrs Skinner’ had been left the property by James Albert Hodges in his will written in 1919. At the time of the will he left ‘All the rest residual and remainder of my estate of every description I give to Winifred Louisa Woodall a sister at the Royal Infirmary, Bristol absolutely’. In 1923 Winifred Louise Woodall had married Cedric G Skinner in Bristol. Reverend J. B. Alger – the 1916 Prewett’s Street Directory shows the house, then called ‘Clovelly’ was occupied by Revd J. B. Alger. We suspect that this is Joseph Bailey Alger who married Fanny Elizabeth Archbutt in Kensington in 1871. Joseph was born in Pembroke St Mary in Wales on 18th December 1843. The 1851 Census shows that he was still living there with his stepfather Thomas Morris aged only 32 and his mother Elizabeth aged 40 and the eight children by her previous marriage and their daughter Eliza Morris aged 11 months. By 1861 aged still only 17 Joseph was a boarder with a family in Birmingham, where he was a clerk. By 1871 Joseph had become a Wesleyan minister and he was lodging in Sandhurst in Berkshire. By 1881 he had moved to Scotland with his wife, Fanny Elizabeth and their six children; Bertram aged 8, Jessica aged 7, Vanda aged 6 Eva aged 5 and Rose and Lily both aged 2. Another daughter Kathleen was born in 1883. Joseph seems to have been a popular minister in Scotland. We know that the Glasgow Herald of March 1886 had a report that Joseph Bailey Alger had accepted a unanimous invitation to remain at Coatbridge a third year. The 1901 Census shows that he was a Wesleyan Methodist Minister who was then living in Epworth in Lincolnshire. A report in the South Gloucestershire Chronicle refers to the house as “Clovelly Villa.” Interestingly Miss Bransom was advertising her services as a music teacher in the South Gloucestershire Chronicle of October 12th 1916. She gave her address as Clovelly Villa, John Street. At this time we do not know whether Miss Bransom was a lodger with the Rev Algar and his wife or whether the house was divided into two parts. Joseph Bailey Alger died in Scalloway in Shetland on 6th February 1920. Reverend Frank Tarrant – the 1921 Electoral Register shows Ernest Frank Tarrant and his wife, Olive Mabel were living at what was then called ‘Clovelly’. 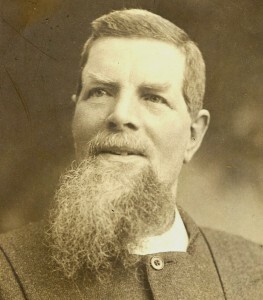 Frank was the minister of the Congregational Church in Chapel Street which later changed its name to United Reformed Church. Selina Wilmot – the 1926 Prewetts Directory shows Selina was living in Clovelly in St John Street. The 1927 Electoral Register also shows her living here. We suspect that she moved here from The Chalet in Alveston following the death of her husband Samuel, in 1923. Reverend Frank Harker – the 1931, 1935 and 1939 Electoral Registers show that the Reverend Frank Edward Harker and his wife, Lilian Louise were living in the house. Frank was born in Shepherds Bush, London on 23rd November 1872. He was the son of John Harker, a draper and his wife, Jane (nee Barker). The 1891 census shows Frank started work as a warehouseman in Croyden. Frank married Lilian Louise Winzar in Croyden in September quarter 1900. Lilian was born in Mottingham, Kent on 27th November 1874. She was the daughter of George Winzar who was ‘Swordbearer for the City of London’. Interestingly Frank and Lilian were living just three doors from each other in the 1891 census. By the 1901 census Frank had become a Congregational Minister at St Neots. They had a daughter, Agnes Lilian, born in 1903. They also had a son, Ronald Frank born in St Neots in 1904, but he died in 1908 aged 3 when the family had moved to Devon. The 1911 census shows Frank was the Congregational Minister at Ashburton in South Devon. They had at least one child, a son, John Kersley Harker born in the Newton Abbot area on 11th June 1911. Frank became minister at Thornbury in 1927. The minutes of the Congregational Church note that in July 1927 were offered a house in Gloucester Road but they ‘had inspected the House in the Gloucester Road and were of opinion that their furniture could not fit into it and in fact did not like it’. The Church was in contact with a Mrs Davis about the possibility of their using her house for the Harkers so we assume that that was one of the houses opposite the Grammar School which was owned by the Davis family. As mentioned above Selina offered to vacate the house she was occupying in Pullins Green to allow the house to be bought by the Church as a Manse and for the Harkers to move in there. Frank arranged and encouraged many activities for the community. People recall that he arranged regular pantomimes involving local children in his back garden and rail trips for the children to Weston Super Mare and Barry Island which were arranged in conjunction with the other churches. Another person remembered that the Reverend Harker, dressed all in black, used to scatter the young lads playing on Pullins Green when he rushed from his house to attend a funeral or service. For another reason, the Rev Harker was very popular with the young people in the area. He had a car at a time when there were very few others in the town. He used to park his car in a garage in Bulls Eye Lane and the young children used to congregate outside his house each evening, hoping to get a ride on the car when Rev Harker took his car to the garage. Apparently he even allowed children to ride on the running boards of the car – although we are told that he did drive very slowly. At Christmas, the Harkers were also popular with children. When they knocked at their house whilst carol singing, they were offered a large biscuit tin of home-made old fashioned mince pies. They were boat shaped ones made with real meat as well as dried fruit. In the Gazette February 13th 1937 there is an article referring to a motor cycle accident in the Gloucester Road, Bristol in which John F Harker aged 25 of John Street Thornburv was riding as a pillion passenger. He sustained slight concussion and a cut hand. The bike was driven by Robert Daniel of Buckover Farm. John Harker must be the son of the Rev Harker who was born in Newton Abbot in September quarter 1911 (although the Free BMDs website shows his name as John K Harker. The Reverend Harker left Thornbury in 1940. The report in the Western Daily Press of 19th June 1940 shows he was retiring because of ill health after twelve and a half years at Thornbury. At the farewell service he was presented with a purse containing Treasury notes and his wife was given a gold wristwatch. Another report in the same newspaper dated 30th August 1940 shows Frank had died in Wenffrwd, Llangollen. Reverend Donald Ford – he served as minister of the church from 1940 to 1945. The 194/1946 rate book shows that Donald left the house on 14th August 1945. Reverend George Nuttall – the Electoral Registers show that the house was occupied in 1946 by the Reverend George Nuttall and his wife, Nesta D. George served as minister from 1945 to 1950. According to locals they had two children, John and Mary. Reverend Bert Deary – the Electoral Registers of 1954 and 1957 show that the Reverend Bert Deary and his wife, Nellie were occupying the house. According to church records he was minister from 1950 to 1958, although we know that he was officiating at some marriages in 1961. Bert had married Nellie Tyers in September quarter 1918 in Newark. Reverend Ronald Ruffell – the Electoral Register shows the Reverend Ronald F.C. Ruffell was living in the Manse in 1965 with his wife, Doris. Ronald had been born in Braintree in Essex in 1913. The Church records show that he was minister from 1962 to 1966 and that he officiated at marriages between 1964 and 1966. Reverend Voice – the Electoral Register of 1970 shows the Manse occupied by the Reverend V. Norman Voice and his wife, Daisy M. The Church records show he was minister from 1967 to 1978 and he officiated at marriages from 1967. Reverend Voice was the last minister of the Church to live in the Manse. The property was finally sold by the Church in the 1980s. The name of the next owners was Holdsworth, then in the late 80s it was bought by Mark Turner and finally in 1991 it was bought by the present owners, Paul and Gwynneth Glover. The property was finally sold by the Church in the 1980s. The name of the next owners was Holdsworth, then in the late 80s it was bought by Mark Turner and finally in 1991 it was bought by the present owners, Paul and Gwynneth Glover.